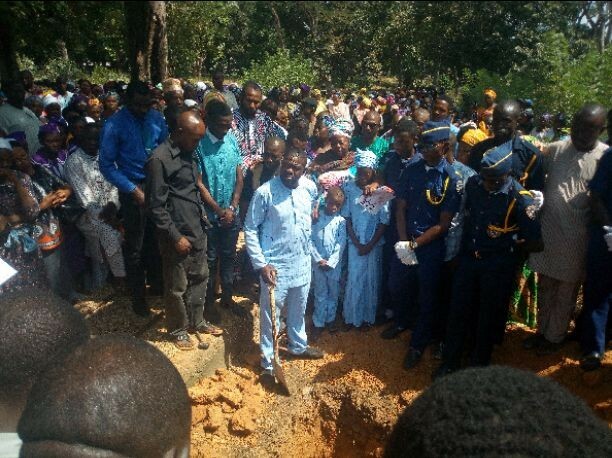 It was a sad moment for family, friends and church members as 39-year-old teacher and mother of two, Esther Taiwo Oloriade who was attacked, strangled and her Peugeot 307 car taken away by her assailant was laid to rest in Kaduna on Monday. The unfortunate incident happened on wee hours of Thursday 9th November this year after her husband, Mr. Gbenga Oloriade had left the house at Angwan Maigero, Chikun local government area of Kaduna State with the two children while she was preparing for the day’s task. It was after her colleagues at a private school, Goodnews Academy where she was teaching did not see her and attempts to reach her through her mobile line failed that, they alerted her husband who after his findings, decided to go back to the house. According to the husband, when he got to the house and the car was not on ground, he concluded that she must have gone out. “But I later discover that, the sound of the television was louder than necessary. Then I became apprehensive and quickly entered the house and I saw rope on her neck with bruises all over her face. I rushed her to the hospital where she was confirmed dead. It was a saddest moment for us. “I had left the house together with the children with the plan to drop them off in school while she was preparing for the school where she was teaching. That was how she was killed and her car taking away by yet to be identified criminals”, he managed to explain. In recent times, crimes at Angwan Maigero has being on the increase without commensurate security by those saddled with the responsibility of securing lives and property of Nigerians wherever they reside. Reverend Simon Adewuyi of First Baptist Church (English Assembly) Kaduna who preached from the book of II Samuel 12: 18-23 at the funeral of the slain teacher told the gathering to do good and serve God faithfully because whether short or long, death is inevitable. “This is a trying time for all of us. A trying moment when we will ask God a lot of questions. Many questions have been asked by the children and husband. Asking the question why may not be wrong after all. But we shall understand it by and by. We should rather be asking the question what next. “God knows the best and he has a reason for what has happened. How do we continue to live after the demise of sister Taye? The church, the colleagues. What then do we need to learn from this? The grace of this hour is to let us know that life is shorter but dead is certain. If Jesus tarries, who will be the next the time no one knows”, he admonished. Late Taiwo Oloriade was born on the 16th November, 1978 in Igbomosho, Oyo State Southwest Nigeria. She was a holder of HND in Food Technology and until her death, a teacher with Goodnews Academy, Damishi, Chikun local government area of Kaduna State. She was survived by her husband, two children and aged parents.